When Hele's Grammar School for Boys moved to a new site in Heavitree, Exeter Technical College moved into the old school premises at Hele Road and became Exeter College. The building of the tower block was the end process of the foundation of Exeter College. Its roots go back to the founding of the Royal Albert Museum in 1869, when the School of Science and the School of Art were created. In early 1891, the Flying Post was commenting that the Council intended to take advantage of a Government Technical Education Act fund to found such an institution or fund lectures and courses as part of the existing School of Science and Art in the museum. Continuous discussion in the paper through the next weeks indicated an eager interest in the subject, in what was sometimes referred to as University Extension lectures. Soon, organisations from across the City were applying for funds to run lectures and courses. In January 1891, the Exeter Working Men's Society met at the Market Hall and requested from the Mayor to have a part of the new funding to continue its own technical education classes, including building construction.The Exeter Trade and Labour Council were also petitioning the City Council for a grant of £150 to be given to the University Extension Committee, to fund a course of lectures on sanitation, and that £360 be granted to the Trade and Labour Council for teaching wood and metal work. Even St Mary Major Church considered asking the Council for a grant for technical education out of the fund, while one letter writer in the Flying Post suggested a series of lectures for policemen to teach them about the symptoms of drunkeness. By June 1891, the City Council sponsored three lectures "for the furtherance of technical education among working men" which "were attended by 660 persons." The University Extension Scheme had also given two 'people's' lectures which were attended by 600 and 300 respectively. The whole system was very adhoc, and ill thought out, and subject to some criticism. By November 1891, the City Council were discussing the possibility of opening a Technical School or a Technical College. On the 25th February 1893, the Council endorsed the recommendation of the sub-committee on Technical Education to appoint a Principal to supervise the technical schools at the Museum and the University Extension College. By September 1893, Miss Montgomery was secretary of the University Extension College, and Mr James Dallas the secretary of the technical department, although there was no announcement of when the Principal would be appointed. 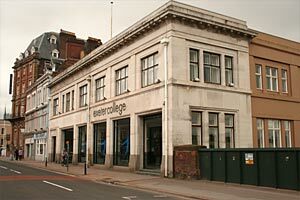 On 2nd October 1893, a meeting was held to formerly open the Exeter Technical and University Extension College, at the Royal Albert Memorial Museum. The Mayor, who presided over the proceedings, thanked Miss Montgomery for her work towards founding the College. The new college was to be divided into the University Extension Department and the Technical Department. Miss Montgomery said she "was glad ... that it had behind it the influence and sympathy of the great University of Cambridge. The College must be a people's College and she hoped all the citizens would feel a personal share in its success." Just before the First World War, it would seem that the City and Guilds of London Technical Institute was running from within the Royal Albert Memorial College. By 1914 there was a 'junior manual and engineering school' housed in the new college building in Upper Paul Street. This had gained the title of Junior Technical and Engineering School in 1915. In 1919, the year after the end of end of the war, this seems to have evolved into the Junior Technical School at Bartholomew Street West. It had space for 80 boys for an education in the building and engineering trades. This institution appears to have continued until at least 1942. By 1947, the Technical School had become the Secondary Technical College for Boys, based in some old army huts at Belmont Park. The name was changed to the Central Technical College by 1954, also at Belmont Park, but with annexes spread through the city including some more, former army huts on the Exeter bypass. 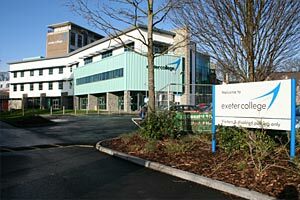 By 1961 the college had changed its name to Exeter Technical College. It moved into the old Heles Grammar School in 1959. 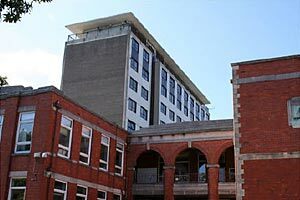 It was in September 1970 that it became the first tertiary college in England – it has been absorbed into the University of Plymouth Colleges network along with other FE colleges in Devon, Cornwall and Somerset. The tower block on the Heles site, was designed in 1958 by H B Rowe the City Architect and the building opened in 1963. The block is 120 ft high with 10 story's and rather rigid, but unlike Renslade House, it does not seem to have such a disastrous impact on its locality. An article in the Express and Echo at the time when the plans were published, in February 1963, emphasised how the tower block had been designed with horizontal elements to complement the vertical design of St David's Church. It was also intended that trees between the tower block and Hele Road would lesson the impact of the building on the area. Attempts were made in 1992-93 to modify the windows and create a grid design, rather than the original horizontal bands. Views from the top of the building extend across Exeter, especially St Thomas and Exwick. Apart from the tower block which also houses a small BBC TV studio, the college has added a sport's hall with a hyperbolic paraboloid roof. 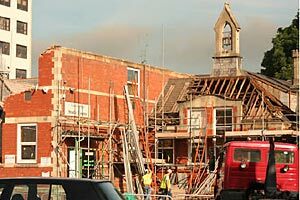 In 2005, work started on demolishing the old Hele's School buildings dating from 1931, and constructing a new front to the main college. The design is more welcoming, and integrates well into the rest of the college complex. Some care has been taken to preserve some of the historic, 19th century buildings that lie behind the new section. The new building was ready for the September 2006 term. There are two main sites and a further nine smaller sites in other parts of the city, including the old Bishop Blackall School site. Courses are aimed at school leavers and adults, and offers studies in business and EFL to international students. The student population in 2007 was 3,700 full time students and 4,500 part time and work based students. There are also several hundred vocational courses provided for 14 to 16 year old students at a number of Exeter and East Devon schools. Sources: Express and Echo, Trewman's Exeter Flying Post, and Discovering Exeter, St David's by Joyce Greenway, 1981. The new frontage to the college completed in 2006. The old Hele's buildings in front of the tower block. Demolishing the old Hele's buildings. The Queen Street premises of the college. It was the site of the Victoria Hall until destroyed by fire in 1919. If you have a photo relating to Exeter College and would like to share it, please contact me on the email address at the foot of the page.